Citrus is a common term and genus (Citrus) of flowering plants in the rue family, Rutaceae. Citrus is believed to have originated in the part of Southeast Asia bordered by Northeastern India, Myanmar (Burma) and the Yunnan province of China. Citrus fruit has been cultivated since ancient times. 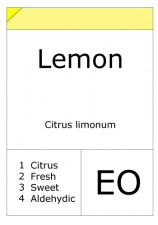 One of the most important citrus oils for toilet water and colognes is lemon oil. When hand-pressed, the oil has a fresh fruit note. Most lemon oil comes from Italy and the United States. 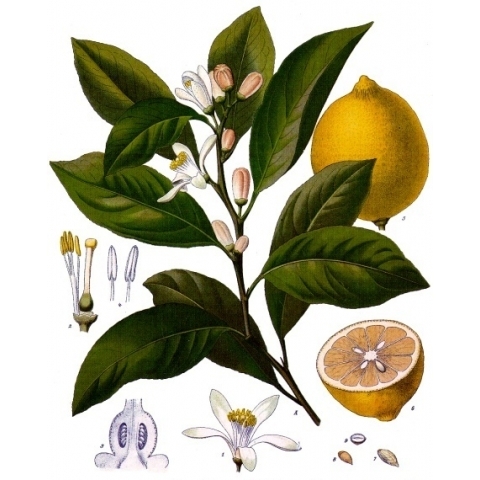 Lemon oil is produced from the outer peel of the lemon fruit through cold pressing. 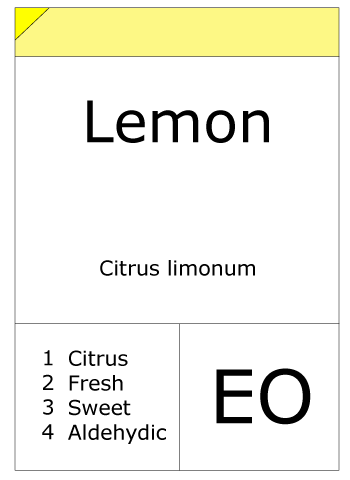 Constituents of lemon include limonene, which is responsible for the oil's tangy-fruity aroma, and citral, which is responsible for the lemon note. Bergaptene free lemon (FCF) reduces the end users susceptibility to photosensitizing.